For digital television converter boxes, see digital television adapter. "D2A" redirects here. For the D2A dive bomber, see Aichi D1A. 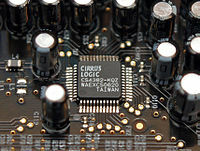 8-channel Cirrus Logic CS4382 digital-to-analog converter as used in a sound card. In electronics, a digital-to-analog converter (DAC, D/A, D2A, or D-to-A) is a system that converts a digital signal into an analog signal. An analog-to-digital converter (ADC) performs the reverse function. DACs are commonly used in music players to convert digital data streams into analog audio signals. They are also used in televisions and mobile phones to convert digital video data into analog video signals which connect to the screen drivers to display monochrome or color images. These two applications use DACs at opposite ends of the frequency/resolution trade-off. 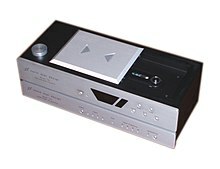 The audio DAC is a low-frequency, high-resolution type while the video DAC is a high-frequency low- to medium-resolution type. Due to the complexity and the need for precisely matched components, all but the most specialized DACs are implemented as integrated circuits (ICs). Discrete DACs would typically be extremely high speed low resolution power hungry types, as used in military radar systems. Very high speed test equipment, especially sampling oscilloscopes, may also use discrete DACs. Piecewise constant output of a conventional DAC lacking a reconstruction filter. In a practical DAC, a filter or the finite bandwidth of the device smooths out the step response into a continuous curve. An ideal DAC converts the abstract numbers into a conceptual sequence of impulses that are then processed by a reconstruction filter using some form of interpolation to fill in data between the impulses. A conventional practical DAC converts the numbers into a piecewise constant function made up of a sequence of rectangular functions that is modeled with the zero-order hold. Other DAC methods (such as those based on delta-sigma modulation) produce a pulse-density modulated output that can be similarly filtered to produce a smoothly varying signal. As per the Nyquist–Shannon sampling theorem, a DAC can reconstruct the original signal from the sampled data provided that its bandwidth meets certain requirements (e.g., a baseband signal with bandwidth less than the Nyquist frequency). Digital sampling introduces quantization error that manifests as low-level noise in the reconstructed signal. DACs and ADCs are part of an enabling technology that has contributed greatly to the digital revolution. To illustrate, consider a typical long-distance telephone call. The caller's voice is converted into an analog electrical signal by a microphone, then the analog signal is converted to a digital stream by an ADC. The digital stream is then divided into network packets where it may be sent along with other digital data, not necessarily audio. The packets are then received at the destination, but each packet may take a completely different route and may not even arrive at the destination in the correct time order. The digital voice data is then extracted from the packets and assembled into a digital data stream. A DAC converts this back into an analog electrical signal, which drives an audio amplifier, which in turn drives a loudspeaker, which finally produces sound. Most modern audio signals are stored in digital form (for example MP3s and CDs) and, in order to be heard through speakers, they must be converted into an analog signal. DACs are therefore found in CD players, digital music players, and PC sound cards. In voice over IP applications, the source must first be digitized for transmission, so it undergoes conversion via an ADC, and is then reconstructed into analog using a DAC on the receiving party's end. IBM Selectric typewriter uses a mechanical digital-to-analog converter to control its typeball. A one-bit mechanical actuator assumes two positions: one when on, another when off. The motion of several one-bit actuators can be combined and weighted with a whiffletree mechanism to produce finer steps. The IBM Selectric typewriter uses such a system. The pulse-width modulator where a stable current or voltage is switched into a low-pass analog filter with a duration determined by the digital input code. This technique is often used for electric motor speed control and dimming LED lamps. Oversampling DACs or interpolating DACs such as those employing delta-sigma modulation, use a pulse density conversion technique with oversampling. Speeds of greater than 100 thousand samples per second (for example, 192 kHz) and resolutions of 24 bits are attainable with delta-sigma DACs. The binary-weighted DAC, which contains individual electrical components for each bit of the DAC connected to a summing point, typically an operational amplifier. Each input in the summing has powers-of-two values with most current or voltage at the most-significant bit. These precise voltages or currents sum to the correct output value. This is one of the fastest conversion methods but suffers from poor accuracy because of the high precision required for each individual voltage or current. This type of converter is usually limited to 8-bit resolution or less. Switched resistor DAC contains a parallel resistor network. Individual resistors are enabled or bypassed in the network based on the digital input. The R-2R ladder DAC which is a binary-weighted DAC that uses a repeating cascaded structure of resistor values R and 2R. This improves the precision due to the relative ease of producing equal valued-matched resistors (or current sources). The successive approximation or cyclic DAC, which successively constructs the output during each cycle. Individual bits of the digital input are processed each cycle until the entire input is accounted for. Most DACs, shown in this list, rely on a constant reference voltage to create their output value. Alternatively, a multiplying DAC takes a variable input voltage for their conversion. This puts additional design constraints on the bandwidth of the conversion circuit. The number of possible output levels the DAC is designed to reproduce. This is usually stated as the number of bits it uses, which is the base two logarithm of the number of levels. For instance a 1 bit DAC is designed to reproduce 2 (21) levels while an 8 bit DAC is designed for 256 (28) levels. Resolution is related to the effective number of bits which is a measurement of the actual resolution attained by the DAC. Resolution determines color depth in video applications and audio bit depth in audio applications. A measurement of the maximum speed at which the DACs circuitry can operate and still produce the correct output. As stated above, the Nyquist–Shannon sampling theorem defines a relationship between this and the bandwidth of the sampled signal. The ability of a DAC's analog output to move only in the direction that the digital input moves (i.e., if the input increases, the output doesn't dip before asserting the correct output.) This characteristic is very important for DACs used as a low frequency signal source or as a digitally programmable trim element. A measurement of the distortion and noise introduced to the signal by the DAC. It is expressed as a percentage of the total power of unwanted harmonic distortion and noise that accompany the desired signal. This is a very important DAC characteristic for dynamic and small signal DAC applications. A measurement of the difference between the largest and smallest signals the DAC can reproduce expressed in decibels. This is usually related to resolution and noise floor. ^ Brian Brumfield (2014-09-02). "Selectric Repair 10-3A Input: Keyboard" – via YouTube. ^ "Data Converter Architectures" (PDF). Analog-Digital Conversion. Analog Devices. Archived (PDF) from the original on 2017-08-30. Retrieved 2017-08-30. ^ "Binary Weighted Resistor DAC". Electronics Tutorial. Retrieved 2018-09-25. ^ "Data Converter Architectures", p. 3.29. ^ "Multiplying DACs: Flexible Building Blocks" (PDF). Analog Devices. 2010. Retrieved 2012-03-29. ^ "ADC and DAC Glossary". Maxim. Archived from the original on 2007-03-08. S. Norsworthy, Richard Schreier, Gabor C. Temes, Delta-Sigma Data Converters. ISBN 0-7803-1045-4. Mingliang Liu, Demystifying Switched-Capacitor Circuits. ISBN 0-7506-7907-7. Phillip E. Allen, Douglas R. Holberg, CMOS Analog Circuit Design. ISBN 0-19-511644-5. Robert F. Coughlin, Frederick F. Driscoll, Operational Amplifiers and Linear Integrated Circuits. ISBN 0-13-014991-8. A Anand Kumar, Fundamentals of Digital Circuits. ISBN 81-203-1745-9, ISBN 978-81-203-1745-1. Ndjountche Tertulien, "CMOS Analog Integrated Circuits: High-Speed and Power-Efficient Design". ISBN 978-1-4398-5491-4. This page was last edited on 20 February 2019, at 13:52 (UTC).